For high quality residential and commercial snow plowing services in the greater Dedham MA area, trust the experts at DT Landscape Maintenance & Construction. With a decade of experience serving in the Norfolk County area, DT Landscape Maintenance & Construction has flourished into a a successful, year-round landscaping company. We provides the highest caliber of professional results that will exceed your expectations every time. We pride ourselves on always exceeding expectations and employing only the most skilled, highly trained landscape crew. With seasoned veterans employed in all phases of the job, you can always rely on prompt service from a trusted crew with attention to detail and unrivaled workmanship. You can always count on DT Landscape for reliable and affordable service that works for you and your property. Harsh New England winters affect our ability to travel and shoveling snow is timely and exhausting. Allow DT Landscape to take care of your snow removal needs. 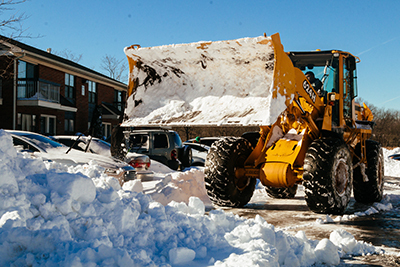 With a full fleet of new equipment, DT Landscape provides fast, dependable snow removal and snow plowing services for both residential and commercial properties. Not only is snow and ice a huge inconvenience, but removing it is essential to protecting the safety of you, your family, or your customers. Don't land yourself in a slippery situation by trusting and unreliable or unprofessional snow and ice removal service. At DT Landscape, we will always provide prompt, reliable service that will ensure that not only can your customers reach you, but they will do so safely and without delay. Most homeowners don't have the time and energy to keep up with the back-breaking process of constantly shoveling snow throughout the winter. Leave your hassles behind and let DT Landscape provide you with affordable snow and ice removal services. Contact the professionals at DT Landscape Maintenance & Construction today for all your residential and commercial snow removal needs! hardscapes for comfortable, luxurious outdoor living. The contents of this webpage are Copyright © 2019 DT Landscape Maintenance & Construction. All Rights Reserved.